David Platillero was riding his bike to class at the Blackbird Academy music school in Nashville, Tennessee, when he got into a terrible accident that would change his life. A year and a half ago, a driver ran a red light and crashed into the then 24-year-old. Platillero cracked his head on the windshield as he was launched into the air. 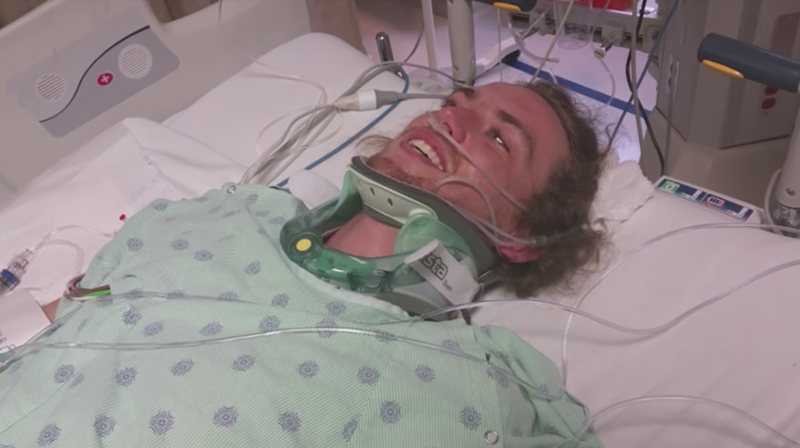 "I was told my body went about 10 feet in the air and landed on the pavement 100 feet away," Platillero, who goes by the stage name David Francisco, told CBS News. "I don't remember any of it." The only thing he can remember is waking up in a hospital gown with his arm in a splint and both of his legs propped up, covered in bandages. The hospital notified his parents about the accident and their son's serious injuries. They drove 100 miles from Knoxville, Tennessee, to be by his side, as doctors at Vanderbilt University Medical Center prepared them for the worst. "The arm is the last of his concerns," David's father, John, recalled an orthopedic surgeon telling him over the phone. "He has a severe spinal cord injury." "It's like the worst call you could possibly get," David Platillero said. "They told me I was never going to walk again." For 10 days, he lay in a hospital bed thinking about his injuries. "I cried every day," he said. "Who would want to marry someone — who would want to be with someone like me who's dependent on people? It was sad." But he was also worried about the woman who hit him. He never stopped asking about her. "From what I was told, she really distraught over the whole thing," Platillero said. "She had been crying. I didn't want her life to be ruined because of this." Platillero wanted to get in touch to offer his forgiveness. "It sounds like it was an accident," he said. For five months, as he underwent physical therapy at the Shepherd Center in Atlanta, Platillero searched for the driver, who he later discovered was 23-year-old Freya Markowski. Then one day, he got a text. "I lost my soul after the accident," Markowski wrote. "I want you to know not a day goes by without me crying for your pain." "I realized who it was," Platillero said. "It was just incredible I remember thinking I've got to sit down and actually respond to this." Platillero replied with a video of himself walking with braces and a harness. "Whoa, that's awesome," Markowski replied. The pair kept in touch, texting or video chatting at least once a month. Platillero told Markowski about his progress in physical therapy. In return, Markowski told him about her struggles — how she was diagnosed as bipolar and struggled with addiction. Markowski didn't use drugs the day of the accident, but she also hadn't been taking her medication to treat her bipolar disorder, Nashville newspaper The Tennessean reports. "The enemy is the drug, not her," Platillero said. In October 2016, six months after the accident, Platillero's dad attended a hearing where Markowski faced charges of failure to yield causing serious injury. "I told him, 'Let's not press charges. See what they say whatever would be best for her,'" David Platillero said. "We didn't think prison was going to be good for someone who has already had so many things happen." Markowski was shocked. The charges were dropped. "I thought I was going to jail that day. Instead this angel of a man shows up with open arms. David's dad gave me a really big hug," Markowski told The Tennessean. "How is that possible? The dad of the guy who I paralyzed?" Last spring, nearly a year after the accident, Platillero and Markowski decided to meet at a local coffee shop. Platillero stepped out of a car in crutches, and Markowski began to tear up. "She thought I was going to come in a wheelchair," Platillero said. "We hugged for maybe thirty seconds, without saying a word." Markowski expressed her sorrow and apologized, and Platillero finally told her what he'd been waiting to say in person for a year: "I forgive you." He continues to update Markowski on his progress monthly. He's slowly been regaining movement in his legs. He can walk with the assistance of crutches, but he still doesn't have bowel or bladder function. "Everything below the waist isn't gone, but I don't think it ever will be the same," Platillero said. "I'm still getting stronger, working out every day. I'm thankful for the things I have." Platillero was inspired to write several songs in rehab, and even helped create a documentary film called "Back to Blackbird," which narrates his road to recovery. He recently moved Los Angeles to pursue a career in music. But that doesn't mean he's forgotten Markowski. In fact, he invited her to his wedding in February. "We still talk frequently," Platillero said. "We'll always have this weird bond."